For powering high-drain electronics such as digital cameras, the most efficient batteries to use are high-capacity Nickel Metal Hydride (NiMH) cells. Higher capacity batteries store more charge and they can power your devices longer. The highest capacity rechargeable AA batteries are: Ansmann’s 2850 mAh batteries and Powerex’s 2700 mAh batteries. Of these two batteries, Powerex’s 2700 mAh gets the most positive reviews from photographers. It received an average of 4 out 5 stars from 98+ reviewers on Amazon. 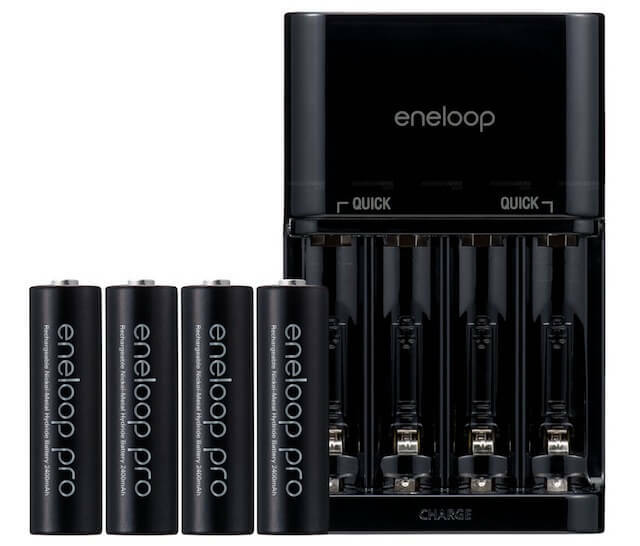 However, in my opinion, the best choice for a high capacity AA battery is now the Eneloop Pro. These batteries hold their charge for 12 months. They also have a high energy capacity (2500 mAh), and they perform better than similar high-capacity AAs. See my review here. Do Rechargeable Lithium-Ion AA Batteries Exist? Since when is 2800 mWh a higher capacity than 3000 mWh (like Kentlis)? I don’t cover lithium-ion batteries here – were talking about standard rechargeable NiMH batteries here. I cover lithium-ion batteries in a separate post. The most efficient batteries to use are high-capacity Nickel Metal Hydride (NiMH) cells. ! Shawn: the 5v is for devices that take 4 AA batteries – 1.2v * 4 = 4.8v, or 1.5v * 4 = 6v. It’s not referring to a single AA battery operating at 5v by itself. You have to be careful what you recommend here. Powerex actually provide a great charger analyser by Maha, with it I provided open details on all batteries I sold. Firstly I tested them all, Sony cyclenergy (white and silver), Eneloop, Camelion, GP, many cheap Chinese variations and more expensive Chinese variations. The only brand that could “reach” its advertised capacity “and maintain” that capacity was Eneloop. The Powerex 2700 that came with the charger were rubbish, the Silver Sony were similar. They are good for short term high drain use only, also their capacities were varied out of the box, became better with the Maha’s break-in function but in use became more varied again and loosing capacity. The White Sony’s couldn’t even be matched, one cell was short by a large amount and still 300mAh short after several break-ins. Generally speaking batteries are terrible, branded capacities are way off, more so on Chinese batteries. Eneloop & Camelion were the best of the well known brands. Ultracell Plus+ was the best Chinese battery, their AAA also had and maintained the highest capacity of any other AAA NiMH I tested. Another brand was Powercell they had the best LSD, better than the generation 2 Eneloop I was testing them with. But the capacity is way off what was marked. But for things like remotes they were as sooted to them as Eneloop with a fraction of the price. Also the climate you live in changes the way each brand behaves. The hot humid climates of Asia take a toll on many brands, again the above batteries I recommend still performed as usual. My wife uses the Ansmann’s 2850 mAh batteries in or Apple mouse and they have always been reliable. I’ll have to give the Eneloop Pro’s a try! I’ve had these batteries for a while, and I’d say so far, so good! I’m extremely happy with them! I use Ansmann’s 2850 mAh batteries all the time and they truly are the best! It’s not worth it buying the cheap energize batteries and throwing them out just a few weeks or month later. Do yourself a favor and invest in some batteries that will last! 1.2v vs 1.5 volts is a misnomer. “1.5v” alkaline cells spend most of their life in the ~1.2v range, so anything that works at that voltage will work. NiMH cells actually have a coincidental advantage of having a much flatter voltage range. Thank you for the information! the most efficient batteries to use are high-capacity Nickel Metal Hydride (NiMH) cells. I have been told, it’s not primarily the voltage, but the amperes at which the voltage is discharged that is key. Excellent information everyone, I’m on my 2nd set of Energizer 2500mAh NiMH batteries, these are listed at 1.2V. the first set lasted 15 months and came with the charger for $ 31.97 at Walmart. the 2nd set has lasted 22 months and cost $ 24.99 at The Source (Used to be Radioshack) I had trouble finding the 2500’s it seems they’ve been replaced by the 2300’s. The bigger issue is charging the cells to full capacity. I use the excellent La Crosse conditioner. In regular charge mode, the 2500-2700mAh cells I have charge to 700-1400mAh. In discharge/recharge mode, the cells charge to near capacity. Although the “nominal” voltage is higher for alkaline and zinc batteries (1.5) than for NiMH and NiCd (1.2) the actual voltage varies through the discharge cycle and batteries (all these types) are generally counted as fully discharged with a remaining voltage of 1V. Look at the discharge curves and you will see this means NiMH will work just as well if not better in most applications. Most modern electronics will specify 1.5v Alkaline or Nickel, or 1.2v Ni-MH or Ni-CD, so shouldn’t be an issue if you’re using something in the last few years. As for the extra mAh worth the price, it’s what you need the batteries for. If you are a professional or aspiring photographer, the extra power in your flash will make a huge difference in your flash recycle time. Definitely worth it. If it’s for a portable alarm clock, or even wii remotes, you’ll be fine with regular rechargeables, like the Energizer, or even the hybrids, which slow drain for those items only used occasionally. Becareful about some rechargeables. They can be found in 1.2v rather than 1.5v ( you may nee to check ) and for some devices that need a solid 5v to run – 4 AA batteries at 1.5v is fine where 4 batteries at 1.2v will distress the interal powering or not work at all. Great tip about the voltage – I never noticed that before. Rechargeable batteries have always been 1.2V… As long as i can remember…and ive been using them a little over 20 years!! Also never had a problem using rechargeables in an item like a flashlight or other item that required 6V…not sure what your using that runs at 5V??? He’s not saying that the required voltage is 5v, he is saying that some electronics require the 6v from 1.5 volt AA batteries as the lower 5v from rechargeable batteries can damage some electronics and just to add I’ve been using these daily for almost 40 years. It’s clear you really don’t understand battery chemistry as well as voltage requirements and curves. I would be happy to educate however I charge for that as this is my business!! I’m no amateur, I have been involved in my earlier years in the design and production of cells so please don’t assume that you have more knowledge as you’ve “messed around ” with rechargeable batteries for 20 years. The letters after my name are my credentials…. Will I really get 3x the usage out of an Ansmann or even 2x out of the Delkins? If not, then sticking with the Energizer 2500mAh cells is the way to go.